BRITISH cycling legend Sir Bradley Wiggins CBE brings fascinating tales of his time both on the track and road to St David’s Hall on Saturday 17 November! Fans can expect an amazing insight into his experiences and a rare glimpse into the personality behind the back-page headlines. Throughout his stunning career, ‘Wiggo’ established himself as a household name and national treasure as Britain’s most decorated Olympian. With Bradley at its forefront, cycling has never been more popular across the UK and his success has inspired millions to get on their bikes. Bradley won an incredible six world titles and three Olympic golds on the track before focusing fully on the road where a near-perfect run saw him win the prestigious yellow jersey at the 2012 Tour de France. Along with is gold medal at the London Olympics, he then capped a sensational 12 months by being crowned BBC Sports Personality of the Year. At the glamorous ceremony, his easy charm in front of the cameras captured the hearts of the nation. The following years brought even more accolades including the Tour of Britain title in 2013, and the rainbow jersey at the 2014 World Time Trial Championships. 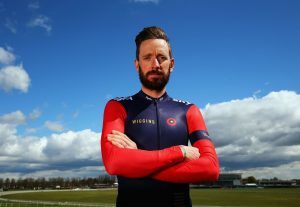 After a hugely successful spell with Team Sky, Bradley founded Team Wiggins before winning his fifth gold medal at the 2016 Rio Olympics and his eighth Olympic medal overall. Don’t miss this one-off chance to spend an evening with cycling hero Bradley Wiggins at St David’s Hall! Tickets are £34.50 (plus an optional £1 postage fee).